Much time has been spent examining trends among generational groups to provide financial advisors with actionable insight into differentiating behaviors and biases. What is rarely discussed, however, are the similarities these groups have in terms of investment goals and strategies. Retirement savings. A recent survey by Stash revealed that saving for retirement was the top investment goal among baby boomers, Gen Xers, and millennials. But why this is a high priority differs depending on the group. Baby boomers: In this group, many have entered retirement or will be doing so soon. They recognize the shorter time horizon they have for accumulating assets. 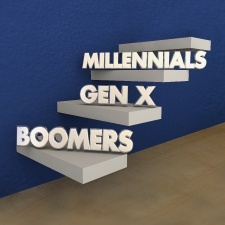 Gen Xers and millennials: The younger generations have been inundated with information on the importance of self-funding retirement due to the phasing out of corporate pension plans, the increasing adoption of defined contribution plans, and a general skepticism about the sustainability of government-sponsored retirement support (e.g., social security). Asset allocation. Two independent market surveys—from Legg Mason Global Asset Management and the Wells Fargo Investment Institute—determined that there was an overallocation to cash, a similar absolute weighting toward fixed income investments, and a clear preference for equities across generations. Surprisingly, these consistencies appeared despite differences in time horizons, stated risk tolerances, and investment goals. Figure 1 outlines these asset allocation patterns across generational groups and compares the results with the average allocation of U.S. target-date funds. Adoption of technology. Among boomers, Gen Xers, and millennials, there is largely uniform adoption of technology to monitor and interact with their investments. This may be surprising, as it stands to reason that adoption would be higher among younger individuals who grew up with technology. But according to a Pew Research Center report, roughly two-thirds of those 65 and older go online. The key difference is the type of device (e.g., laptop, tablet, smartphone) each group typically uses to access financial information. Of course, investment trends also differ across generations, due in part to various financial events. Specifically, boomers lived through the post-World War II economic boom and the runaway inflation of the 1970s. The 1987 market crash, dot-com bubble, and a notable recession all affected Gen Xers. Finally, millennials have been shaped by the Great Recession, historically low interest rates, and soaring student loan debt. Keep these influences in mind as you think about the varying attitudes toward risk, investment sentiment, and investment preferences seen across generations. Millennials: This group categorized its overall risk tolerance for long-term investing (defined as 10 years or more) as “very conservative” more frequently than Gen Xers or baby boomers did. Baby boomers: Boomers were the most likely to identify with a “somewhat aggressive” overall risk tolerance for long-term investing. Given the investing time horizon for each group, you might think that those with more time to invest would have a greater risk tolerance. But that doesn’t appear to be the case. Why? Perhaps because boomers benefited more from the extended bull run after the crisis than did millennials. Indeed, boomers had more assets to invest, while many millennials were just entering the workforce. Portfolio outlook. Despite their self-proclaimed conservatism, millennials responded with the most enthusiasm for their portfolio outlooks in the Legg Mason survey. The majority said they were “very optimistic” about their portfolio outlooks and were planning to take on “much more risk” or a “little more risk.” Both Gen Xers and boomers were tempered in their outlooks, leaning toward “somewhat optimistic.” While Gen Xers were relatively balanced between taking on more risk and maintaining their current portfolios, boomers were staunchly focused on staying the course. Asset allocation. The Legg Mason and Wells Fargo surveys found that all three generational groups held large allocations to equities. But millennials were the only group to allocate meaningfully to international or emerging market equities. Boomers tended to allocate the least internationally, favoring U.S.-based businesses. Gen Xers showed a bias for domestic stocks, but they allocated more to international equities than the boomers did. The surveys also found that boomers were more likely to hold alternative investments, like hedge funds and private equity, while millennials and Gen Xers were more likely to hold real estate, gold, or other precious metals. Finally, the three groups had similar absolute allocations to fixed income asset classes. Both boomers and Gen Xers were underweight fixed income relative to the appropriate U.S. target-date funds, while millennials were overweight by the same means of comparison. This asset allocation difference may reflect boomers’ need for income as they enter retirement, as well as different risk tolerance biases. Whether you are working with boomers, Gen Xers, or millennials, you are likely to find some consistent opportunities across generations. Professional financial advice. All three groups have a stated preference for speaking with a professional about long-term savings and investments. In fact, millennials were the most likely to have engaged with a financial advisor already (according to the Legg Mason survey). In a 2016 study, Principal Funds found that the majority of clients surveyed would strongly consider working with a financial advisor recommended by a family member. This response was strongest for millennials (87 percent) and weakest for boomers (79 percent). Asset allocation. Discussing risk tolerance, investment time horizons, and specific investment goals and objectives will help investors of any generation build more effective portfolios. They will value your expertise in the areas of cash management strategies and increased global diversification (specifically boomers). You may also offer a comprehensive approach to fixed income asset allocation, which may benefit portfolios through enhanced tax efficiency, risk reduction through lower correlations with equities, income augmentation through investment in extended sectors (e.g., high-yield, bank loans, emerging market debt), and more. Financial planning strategies. Each generation can benefit from financial planning strategies that are aligned with their investment portfolios. For example, wealth transfer and inheritance may apply across these groups. Retirement planning for those in a “sandwich generation” (boomers or Gen Xers) may help clients meet income needs, integrate social security, or enhance savings while balancing rising health care costs. Baby boomers, Gen Xers, and millennials all need help with retirement planning, investments, and asset allocation. By understanding their similarities and differences, you can help your clients meet their goals, no matter their generation. What similarities do you see in terms of investing trends in clients of different generations? What are the differences? Please share your thoughts with us below!